Founded Palmetto Plating in 1964, responsible for the coordination of all marketing, production, quality control, safety, environmental, and administrative activities. Responsible for materials and equipment procurement. He also serves as the primary point contact for customer quotations and inside customer service. He is a graduate of Clemson University and has been with Palmetto Plating Co., Inc since 1989. Responsible of supervision of Decorative Chromium, Electroless Nickel, Anodize, Passivation, and Electropolish Processes. He is also a member of our ISO 9001: 2008 Management Team and a graduate of Clemson University. He is married, and has been with Palmetto Plating Co., Inc. since 2003. Responsible for the Laboratory and chemical maintenance of plating baths, wastewater pre-treatment system, Environmental and Safety compliance and is a member of our ISO 9001, ISO 14001, and AS 9100 Management Team. She is a graduate of the College of Charleston with a degree in Chemistry and is a licensed Physical/Chemical wastewater operator. Staci is married with 5 children and has been with Palmetto Plating Company since 2010. Responsible for the ISO 9001:2008, ISO 14001: 2004, and AS 9100 Quality Management Systems. She is also the primary point of contact for customer quotations. She has 2 children and has been with Palmetto Plating Co., Inc. since 2010. 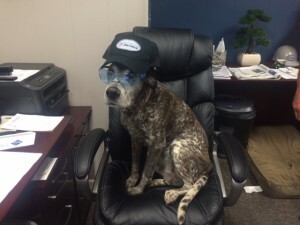 Max is the Palmetto Plating family mascot, he keeps everyone in line and makes sure every thing runs smoothly around the plant.